Brexit chaos could plunge Britain into a general election in weeks, ministers said yesterday. As the Government’s strategy went into meltdown, senior ministers ‘war-gamed’ scenarios that could see a national poll called three years ahead of schedule. Theresa May appeared to hint that an election might be needed to break the deadlock – telling MPs she was not prepared to accept a soft Brexit even if they voted for one. The Prime Minister had been forced to abandon plans to put her withdrawal agreement before the Commons for a third time today after DUP leader Arlene Foster maintained her opposition. 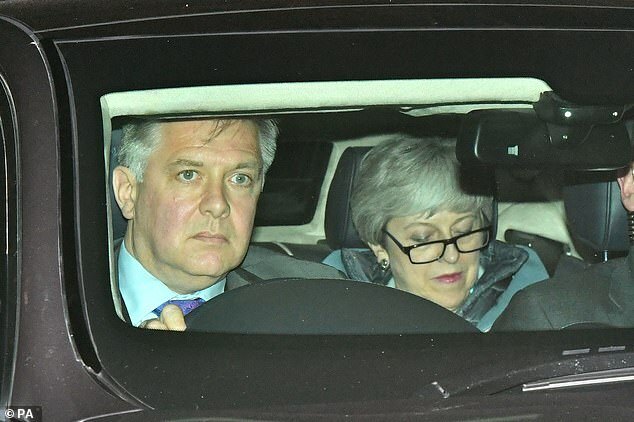 And ministers were braced for MPs to take control of Brexit last night in a bid to make Mrs May pursue other options – or even end the process altogether. The move by Oliver Letwin of the Tories and Yvette Cooper of Labour would let MPs hold ‘indicative votes’ tomorrow on options – including revocation of Article 50 – which Mrs May would then be told to deliver. Downing Street said that the Commons would be asked to vote tomorrow on whether to change the law to extend the UK’s exit date until at least April 12. 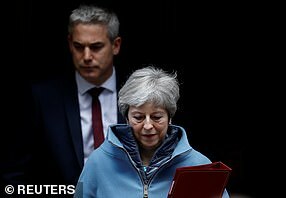 Attorney General Geoffrey Cox told a meeting of the Cabinet that failure to pass Mrs May’s plan in the coming weeks would almost inevitably lead to an election. Writing in the Daily Mail, he today makes a last-ditch appeal to hardline Leavers to get behind Mrs May – or face losing Brexit altogether. Two weeks ago his legal advice led many Tory MPs to reject the withdrawal agreement because of fears the UK could remain in the Irish border backstop. But today he argues the plan’s disadvantages have been ‘exaggerated and demonised’ by opponents of Brexit. If MPs do not vote for the agreement in the coming days, he says the Commons will ‘exert itself’ and try to force either a second referendum, or a plan that keeps the UK inside the customs union and single market. He warns ‘powerful and unreconciled forces’ who opposed Brexit were still trying to stop it and says his biggest fear is the UK will never regain its ‘independence’. The Government is prepared to pull the plug and force a General Election if MPs try to seize control of Brexit and make it softer than Theresa May‘s deal. Ministers including Brexit Secretary Stephen Barclay are said to have raised the prospect if Parliament votes this evening to wrestle control of the withdrawal process. The Commons will tonight vote on a series of amendments to a Government motion that would pave the way to so-called indicative votes taking place on Wednesday. These would allow MPs to show what sort of Brexit they wish to push through if a majority cannot be found for Mrs May’s twice-defeated deal. The talk of forcing a General Election come despite an Opinium poll from two months ago finding that only 12 per cent of Britons would welcome another one, just two years after the last resulted in a hung Parliament. Mr Barclay reportedly repeated at Cabinet today warnings he gave on television yesterday. Speaking on the BBC’s Andrew Marr Show he said that if the Commons took control of the order paper and votes for a different outcome, it would ‘potentially collide with fundamental commitments the Government has given in their manifesto’, though he said the vote itself would ‘not be binding’. International Trade Secretary Liam Fox this morning gave a stark warning to MPs, telling BBC Radio 4’s Today: ‘I was elected, as 80 per cent of members were, to respect the referendum and leave the European Union. ‘I was also elected on a manifesto that specifically said no single market and no customs union. ‘That, for Conservative MPs who are honouring the manifesto, limits their room for manoeuvre. The former hardline Brexiteer turned May loyalist added that the prospect of a longer Brexit delay meaning participation in May’s European Elections would ‘unleash a torrent of pent-up frustration from voters’. ‘I’m not sure that there are many people in the House of Commons who would fancy that particular meeting with voters,’ he said. ‘It would unleash a torrent of pent-up frustration from voters and I think that the major parties will do what they can to avoid having to fight those European elections. He urged MPs to back Mrs May’s deal, warning: ‘For a lot of my colleagues, I think they still believe there is a route to no deal. I have come to the conclusion some time ago that was unlikely given the House of Commons that we have. At yesterday’s Cabinet meeting, Brexit Secretary Steve Barclay repeated his weekend warning that an election would be the logical conclusion of the Government losing control over the Brexit process. Fellow ministers Liam Fox, Andrea Leadsom and Alan Cairns also warned that they believed an election was increasingly likely. One source said: ‘If we lose control of the process then we are heading for an election. A Downing Street spokesman said that Mrs May was opposed to a general election. Mrs May told yesterday’s emergency Cabinet meeting that she hoped to put her agreement to the vote for a third time today. But the move was vetoed by the DUP, whose support is seen as critical in persuading Eurosceptic Tories to fall in line. Mrs May’s deputy David Lidington last night said the Government still hoped to hold a vote this week. But the DUP appeared to be digging in. Deputy leader Nigel Dodds rounded angrily on Mrs May in the Commons yesterday after she said more time was needed to prepare Northern Ireland for the possibility of No Deal. Mr Dodds said the Government was ‘entirely responsible’ for what he described as a ‘fundamental lack of preparation’. Plans for the Government to put forward its own proposals for indicative votes were dropped ahead of yesterday’s meeting. Many ministers, including Dr Fox, Chris Grayling, Gavin Williamson and Mrs Leadsom, are opposed to the process. But Mr Lidington tried to head off a defeat last night by pledging that the Government would provide Commons time for MPs to try to reach an agreement on an alternative Brexit. Sir Oliver told MPs his plan, which has been rejected by MPs twice since the start of the year, would allow Parliament to vote tomorrow on a string of Brexit options. These might include a customs union, a single market, a second referendum and even revocation of Article 50. Labour backed Sir Oliver’s plan. But its Brexit spokesman, Sir Keir Starmer, also refused to guarantee to back any resulting proposal. What amendments did MPs vote on? The Speaker selected three for debate and vote yesterday. One, from Jeremy Corbyn, was a fudge designed to avoid splitting his own MPs and called for votes on a series of options – including a second referendum. Another, from former Labour foreign secretary Margaret Beckett, would have forced MPs to be given a vote on whether to push ahead with No Deal or to delay Brexit. But the most significant was proposed by former Tory Cabinet minister Oliver Letwin and backed by some Remainer Tories, Labour and other opposition parties. It was designed to take control of Brexit out of ministers’ hands. What does the Letwin amendment do? It changes the rules of the House of Commons, the standing orders, to pass control of the agenda from the Government and hand it to backbench MPs. 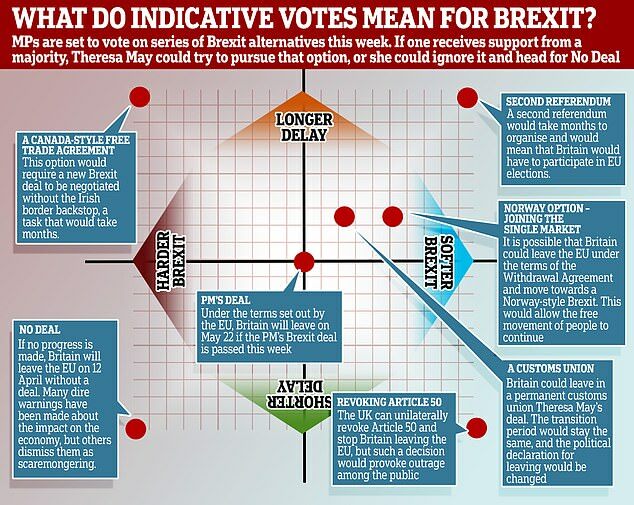 If it passes then tomorrow afternoon MPs will stage a series of so-called ‘indicative votes’ on what should happen next with Brexit. The Speaker will select the motions to be debated, which are likely to include a second referendum, Labour’s Brexit plan, a Customs Union Brexit, a so-called ‘Norway plus’ plan. Unusually MPs will vote on paper – pink slips which list the options. The votes will not be binding on the Government, but will send a strong signal about what kind of Brexit a majority of MPs are prepared to back and would heap pressure on Mrs May. 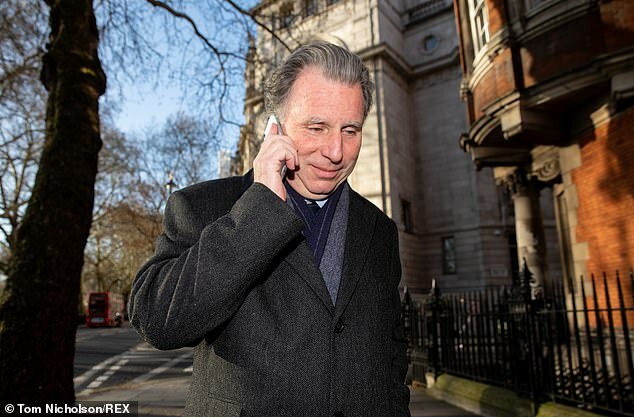 Mr Letwin says he wants to stop No Deal because the Government hasn’t properly prepared for leaving without an agreement. He argues Parliament should take over the process to find a Brexit which can secure the support of the Commons. He is a supporter of the super-soft ‘Norway plus’ option, which is likely to mean the UK accepting single market rules without a say in them and paying vast contributions to the EU Budget. It could also mean a permanent customs union, making trade deals impossible. They say Mr Letwin’s plan amounts to a coup and is ‘constitutionally dangerous’. A leaked Whitehall analysis of the plans to let MPs take charge say they pose a ‘clear and present danger’ to ministers’ ‘ability to govern’. Yesterday Mr Letwin denied his proposal is a ‘massive constitutional revolution’. Is a general election more likely? Several senior ministers argued in Cabinet that if Parliament tried to instruct the executive to do something the Government deeply opposed, such as remaining in the customs union or the single market, an election could follow. 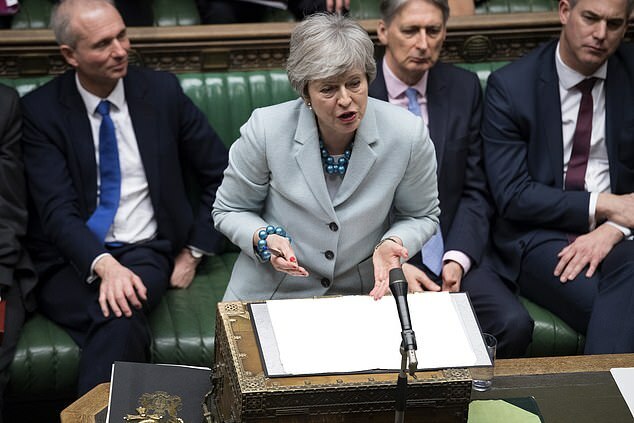 Mrs May indicated as much in the Commons when she argued ‘no-one would want to support an option which contradicted the manifesto on which they stood’. How could an election happen? Under the Fixed Term Parliament Act, the Prime Minister cannot simply call an election. There are two ways one could result. The first is that two thirds of MPs vote for an election when Mrs May proposes one. The second is that the PM loses a confidence vote and nobody can win one – ie command a majority – within a two-week period. MPs wrestled control of Brexit from the hands of Theresa May last night, voting to hold a series of votes that could determine how – if at all – the UK leaves the European Union. 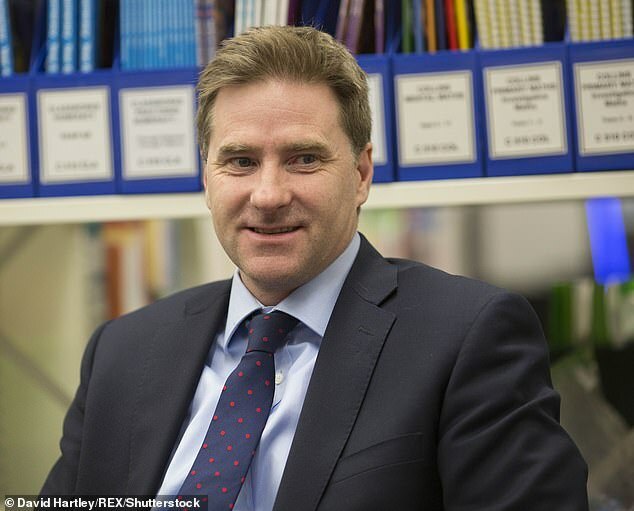 The Commons voted by 329 votes to 302 – a majority of 27 – to approve an amendment brought by Tory ex-minister Sir Oliver Letwin allowing it to take control of business on Wednesday from the Government. 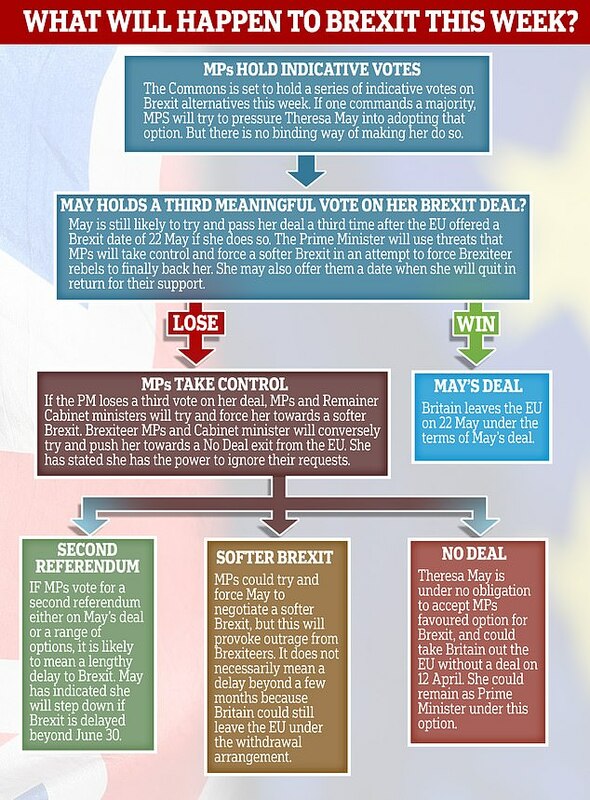 This will allow MPs to select their favorite Brexit option in so-called ‘indicative votes’, which are likely to include soft Brexit options and the possibility of remaining in the European Union. Three ministers were among 29 Tory rebels who defied the Prime Minister and backed the amendment. 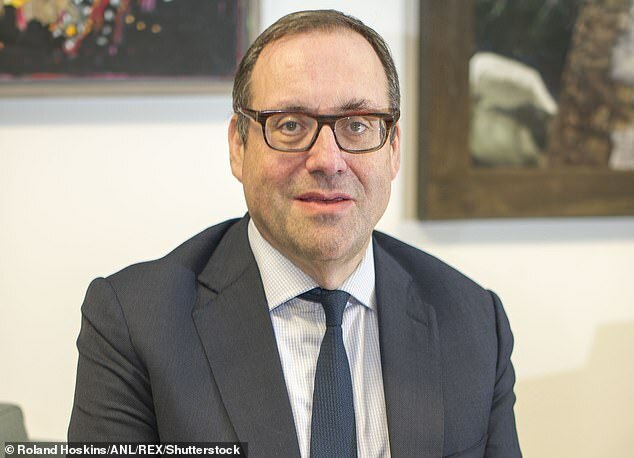 Minutes before the vote Watford’s Richard Harrington quit as an energy minister in order to support the Letwin plan, accusing the Government of ‘playing roulette’ with people’s lives. 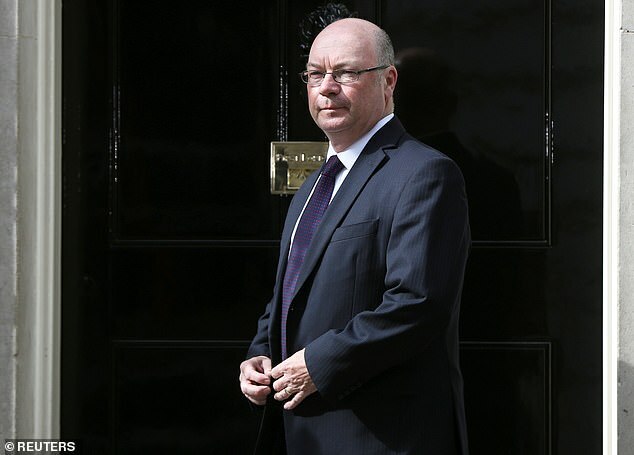 He was followed by Foreign Office minister Alistair Burt and health minister Steve Brine. Other high profile Tories to rebel included former ministers Ken Clarke, Nicky Morgan, Justine Greening, Andrew Mitchell, Sam Gyimah, Damian Green, Alberto Costa and Dominic Grieve, plus Damian Collins, chairman of the Culture Committee. The Government later lost the main motion by 327 votes to 300, the same margin. 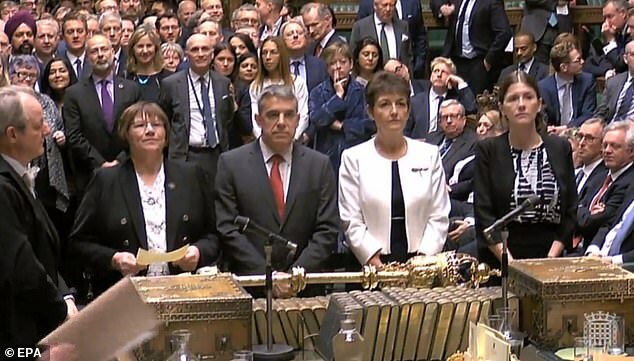 It came after MPs had narrowly rejected a backbench amendment brought by Dame Margaret Beckett to allow the Commons to have a vote if the UK is seven days away from leaving the EU without a deal, by 314 votes to 311, a majority of three. Mr Boles added: ‘We will be relying on the Government to reflect Parliament’s wishes. Fellow Tory rebel Guto Bebb said: ‘The scale of the Government’s defeat and the principled resignations of ministers Richard Harrington, Alistair Burt and Steve Brine tonight are more nails in the coffin of a Brexit deal that very few in the country or Parliament have ever wanted. ‘The Prime Minister has now lost control of this process. Labour leader Jeremy Corbyn also welcomed the result, hailing the fact the House had now ‘taken control’. ‘This House must also consider whether any deal should be put to the people for a confirmatory vote. Tory former minister Ed Vaizey voted both for and against Sir Oliver’s amendment, which is regarded as a formal abstention. Brexiteer Tory backbencher Andrew Bridgen said it was time for Theresa May to quit.